Add the canola oil to the Instant Pot insert and turn on Saute High mode. Stir together the beef strips, soy sauce, sugar, minced garlic and ginger and saute for a few minutes, until beef is cooked through. Add the bell pepper strips and close the lid. Cook on Manual, High Pressure for 2 minutes. Quick release, and stir in cornstarch and water to thicken the sauce. Let sit on Keep Warm mode, until sauce has thickened. 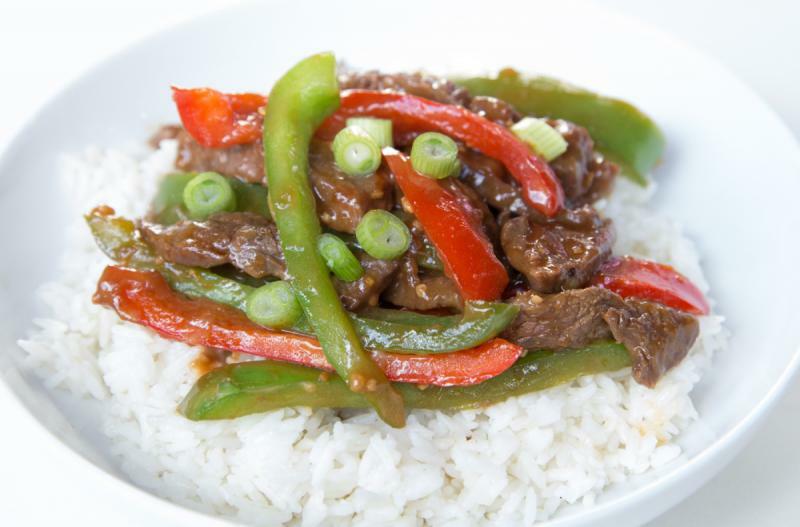 Serve Instant Pot Pepper Steak with rice and egg rolls. Put baggie in the freezer and freeze up to 6 months in fridge freezer or 12 months in a deep freezer. Thaw in the fridge overnight, or a warm bowl of water for about 20 minutes, before transferring to electric pressure cooker insert for cooking. Cook the peppers and beef together. Stir in cornstarch and water to thicken the sauce, as directed in the recipe. Thaw, add hot water to Instant Pot and then add contents of baggie. Cook on high pressure for 15 minutes with sealed valve; then natural release. Quick release, and stir in cornstarch and water to thicken the sauce. Let sit on Keep Warm mode, until sauce has thickened. Serve over rice with egg rolls.